Advantage Bankcard Systems is one of America's only ISOs that is registered with four processing banks. What this means as an agent is that you are able to provide services to any business using any processing method available. You wont ever have to turn someone down for a merchant account. If we cant get them approved, they probably cant get approved. Whether you need to setup a newly established business with an ecommerce merchant account, a restaurant with a complex POS system, or a construction contractor with a level 3 business to business account, you can provide your customers the solution they need. Processing Rates:You get our cost on processing fees and you can markup anything above that. This way, you set your customer's rate and you decide how much profit you are going to make. Submitting Applications: Merchant account applications can be faxed to us and will be entered into underwriting the day they are received. Qualifying accounts can be approved the same day the application is submitted. Lifetime residuals or up-front cash! One day you may want to add to your residual stream. The next day you may need an up front check. It's your account, it's your choice. You choose on an account by account basis, whether you want the up-front bonus or the residual income for that specific account. We investigated our competition and found that almost every one of them requires you to sign at least five accounts per month to get paid. What happens when you don't sign the minimum accounts for the month? You get nothing. With our program, you get your up-front cash and your residuals whether you sign one account or one thousand. 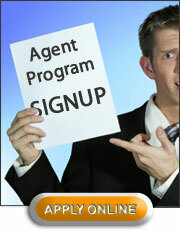 Up Front cash is paid weekly, and residual income is paid bi-weekly.